I really thought that by downloading the WordPress app to both my smartphone and tablet I would be keeping up with my blog, but I guess I’ve been lazy? Maybe lazy isn’t the word. I think “preoccupied” is better. I have been working more on my fiber projects lately since I don’t have to worry about completing projects and assignments for my masters that I finished in Dec 2011. Starting in Jan, I was teaching part-time here in Pueblo and Colo Springs, which wasn’t new for me, but the 6 hr break between classes in Springs was new. It’s difficult trying to find places to go when you’re in a town that is more than 40 miles away from home. You can’t go home to nap or work on a project. Well…you could, but that would be a waste of gas with the way today’s economy is going. On Tuesdays I would go to the Yarn Outlet for their morning knitting session and then to Green Valley Weavers and Knitters until I had to be back at work for tutoring before teaching my early evening class. On Thursdays I would go to a friend’s house to spin. She hand dyes her own fiber and yarn, but also spins herself. Peggy is amazing when it comes to color and spinning. I’d have to say she’s definitely an inspiration when it comes to my spinning. Her business is called The 100th Sheep. You should check her out some time…if anyone’s reading. As a warning, there might be some drooling over her stuff. 😉 By visiting her once a week from Jan to May, I was able to get a lot of spinning done. More than I was getting done probably in the whole year of 2011. 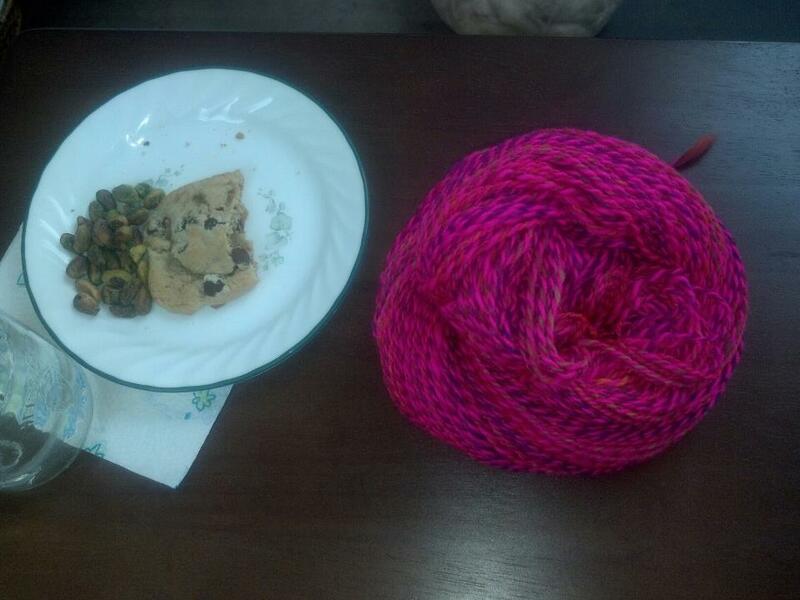 Back in Jan of this year I got some of Peggy’s hand-dyed roving. 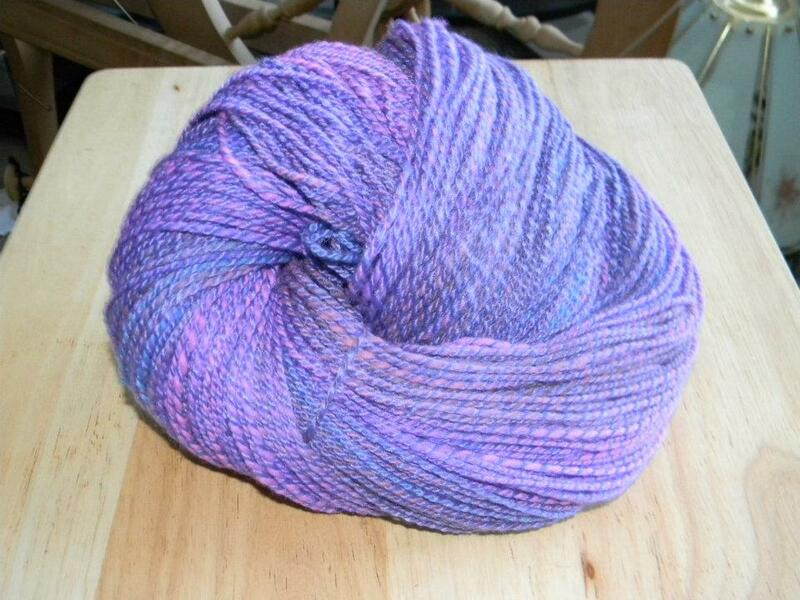 I was able to get some of it spun up. These are my final products for two of the four colors I bought. 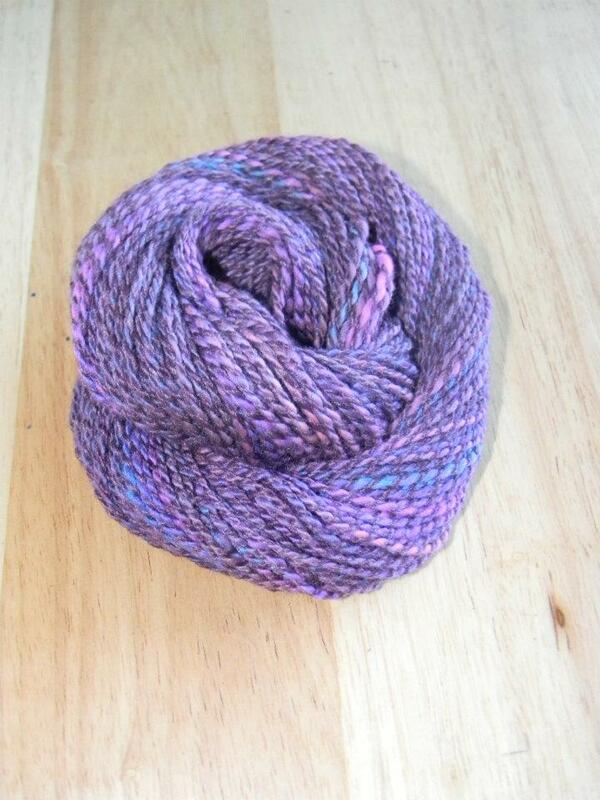 The first is a thick and thin plied with a grape purple merino bamboo. It came out so nice! The second is bright pink combination. The coloring is a little off due to the fact my camera’s coloring is off. I think I’d like to make something for my niece. Even though I don’t like her always wearing pink, this is a fun, bright pink. 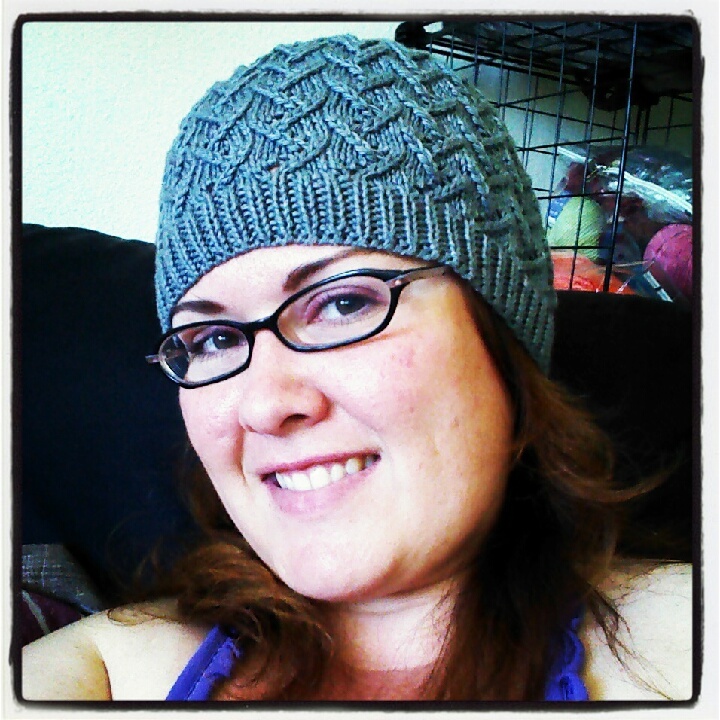 I also had a few projects that I had on bobbins for a while and needed to finish. The first was a CVM that I got at our location shop and I decided to ply it with a Rose Grey Alpaca roving that I had gotten at the Taos Fiber Festival a few years ago. The combination was perfect! 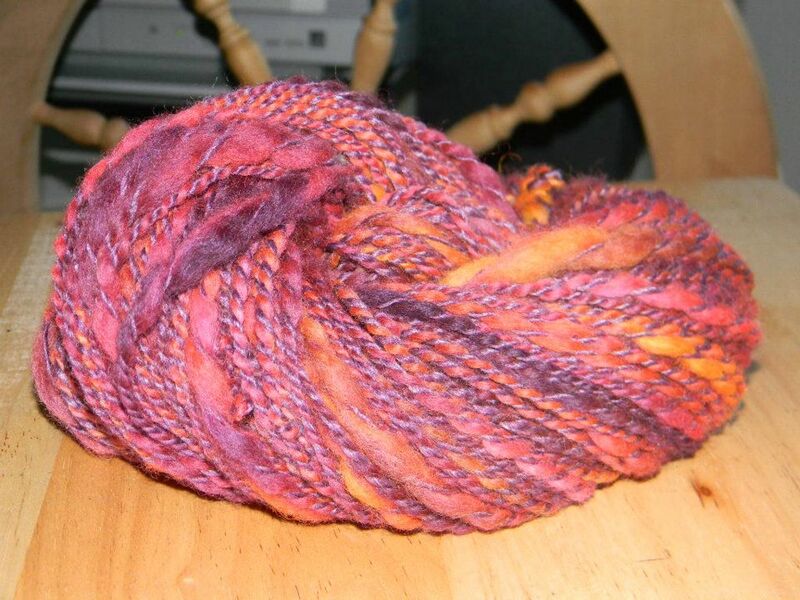 The second is a roving that I got from a friend, Heidi. She does her own hand-dying also. 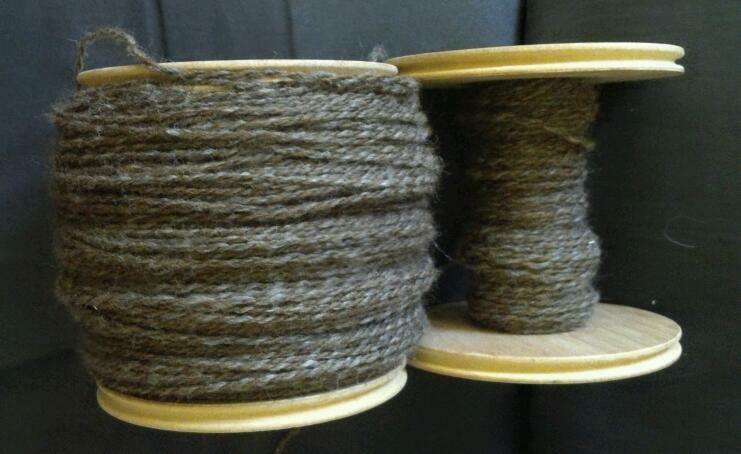 This was a merino, alpaca, silk blend (variegated), and I plied it with two different shades of merino/bamboo. I love it turned out! Also at Green Valley, I joined a Xmas group…yes…Xmas. It’s to help get your Xmas list together of all of the projects that you want to have done before Xmas. So far I’ve done ok. I haven’t gotten as much done as I’ve wanted. I have finished a couple of things. I wanted to make a sweater for a friend of mine’s son. She was my childhood friend back in Ada, OK. I swear I have a completed picture, but I guess this will have to work for right now. I’m also working a hoodie for my 7 yr old niece. I can’t wait til I’m done. I have from the bottom to the armpits, and 1.75 arms done. I just need to complete the second arm and connect it to the body to continue the rest. 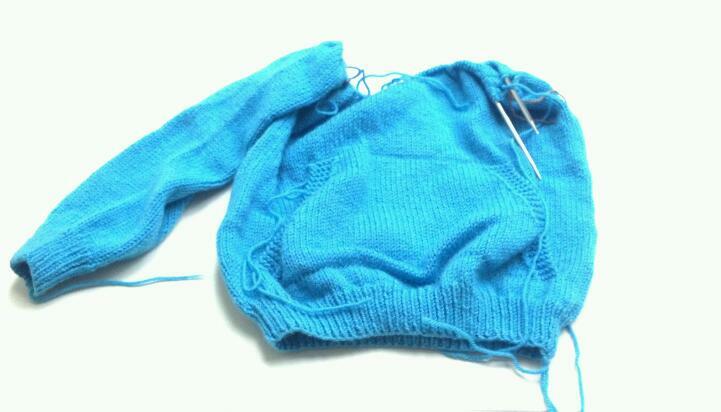 This is the first time I have done a bottom up sweater while attaching the sleeves this way. Then I have plans on working on mini somethings for the close friends and family. I also was able to finish the following square for an afghan that was auctioned off in town. It was a nice combination of work for women that knitted at the shop. While talking to a friend from middle school on FB, I found out that she had been diagnosed with Stage II breast cancer and was going through chemo. I offered to make her a hat that she could wear since she had decided to go ahead and shave her head. She told me that since she lived in Texas that a lot of the hats she was previously wearing were too hot and tightly knit. I offered to make her one using a cotton blend and a somewhat lace pattern. I didn’t want it to be too open. It turned out to be perfect for her. She really likes it and I did too….so I made one for me also. I might make one for my sister too. The grey is for my friend and the pink is for me. 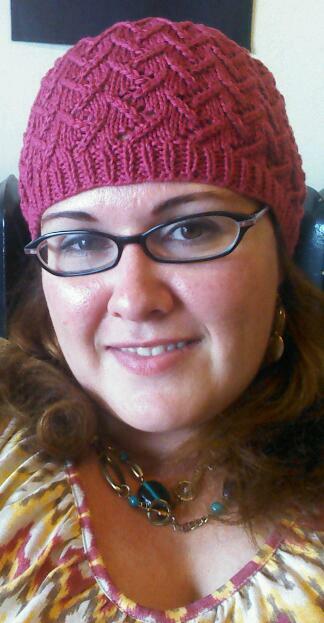 The pattern is called the Lotus Hat, and I found through a blog through Ravelry. I even have a few friends in the knit group wanting to make one too. I did have to alter it since it called for worsted, and I used DK. Every year, except for last year due to finishing my masters, I’ve made mini ornaments for the holidays. I’ve done mini sweaters, santa stockings, beaded cozies that go over a glass ornament, and I think that’s it. Last year I got into the hexipuffs and putting together my own Beekeeper’s Quilt. I’m a math teacher so it just made sense to make my ornaments a hexipuff, but I wanted to add something different this year. I wanted to spin the yarn I was going to knit for these ornaments. I wanted a non-traditional look. I’m not into the standard red, green, and white. The yarn on the left is my first attempt. I found an amazing gold bamboo at Green Valley and wanted to use it for this project. 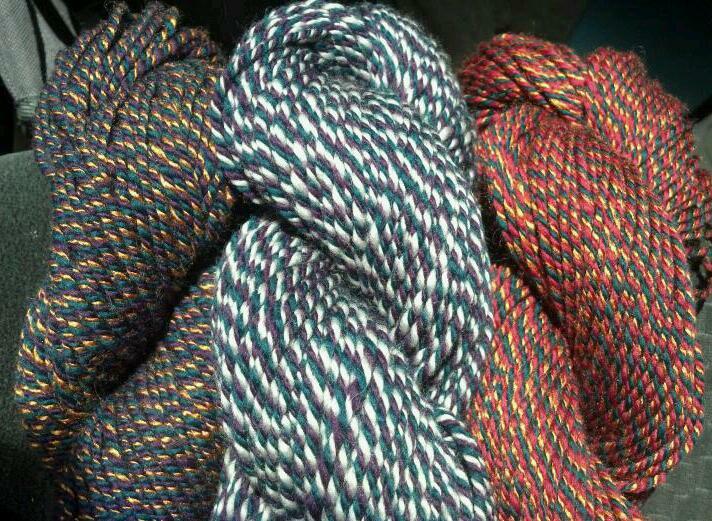 It’s gorgeous, but a little too Mardi Gras (Two merino singles & bamboo). The second (middle) attempt is still pretty. I replaced the gold bamboo with an off white/grey merino. The last attempt is my favorite. It’s a cranberry red with the green merino and gold bamboo from the first skein. I might use them all, but I plan on spinning up more from the last color combination. I’ll definitely have to post more once I have more finished projects.